One toddler out for dinner is a task. Two toddlers out for dinner can border on torture—for everybody in the restaurant. This summer we had to decide whether we would be prisoners of our own creation or if we would take the children out to eat. We took them out to eat. It sometimes bordered on torture. 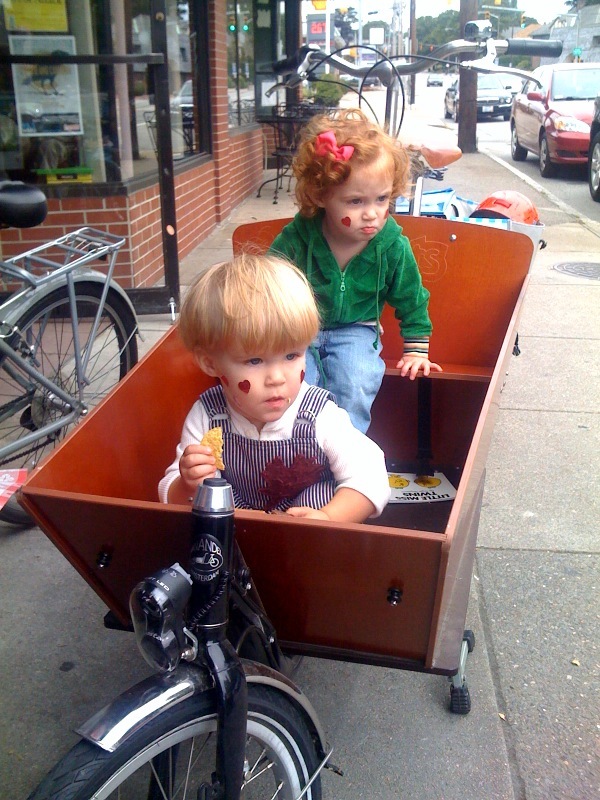 Then we realized we could bike right up to sidewalk seating and use the bakfiets as a pack-and-play on wheels. It is brilliant. S and I can sit at a table, feed them, eat ourselves—all with no to limited struggling! Any meal with limited struggling is a meal from heaven. Plus, they can drop all the food they like in the bike and we only have to hose out the bigger chunks so the squirrels in our garage have no incentive to come down from their rafters.